Basically these made my throat super happy when i was coughing. Yay for tasty vitamin candy. 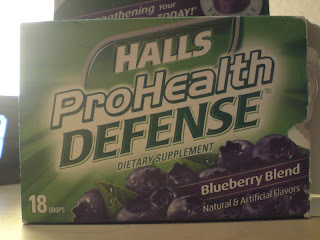 I have a cold and I grabbed these Halls drops at Lucky. They're super yummy and while they're not cough drops, they have Zinc which I read is good for when you're sick, and they have 100% vitamin C too :) I've been drinking Odwalla's with 1000% Vit. C though anyway. Hopefully I'll get over this cold fast, because I have a huge History of Math Test on Friday, ick.